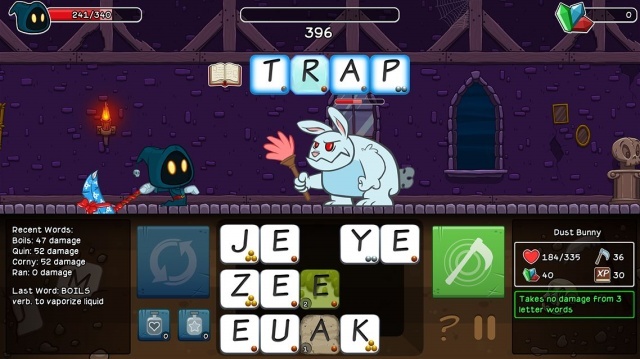 Letter Quest: Grimm's Journey is probably unlike any game that you've played before simply because there aren't many games that fall into the word game/RPG genre. You play as Grimm (or his female counterpart Rose once you unlock her down the line), a little hooded reaper who is cuter than he is scary. He sets off on his quest to track down some pizza, but his journey is continually interrupted by all manner of monsters including book worms and giant bunnies. Getting past these monsters is where the word game play comes in. A grid of assorted letters sits at the bottom of the screen and you'll need to form a word using those letters. The longer the word the better, because the damage that you do to the monster that you're facing will be based on the length of the word that you make. It's similar to Boggle, if you've played that game before, but there are additional considerations in Letter Quest. First of all, letter rarity also affects the damage done by a word. A 'Q' or 'X' will add more damage to a word than an 'E'. Sometimes a letter will appear on a gem tile, and using that letter will add a bonus effect to your attack. Complicating things is the fact that some monsters can only be damaged by certain types of words, for example, words that start with a vowel or that are four letters long. The monsters can also make things more difficult for you by messing with your word grid, locking tiles, turning them poisonous, or changing half of your letters to 'S', among other tricks. After you play a word, the monster takes its lumps, the letters that you used are replaced, and the monster gets its turn to attack you. Play continues like this until you defeat the two or three monsters on a level or you are killed, in which case you'll need to try the level again from the start. Some levels also contain treasure chests and opening them will require a word game, of course. The treasure game is a bit like Hangman or Wheel of Fortune. You're given a word with all of the letters missing and you must guess what those letters are. You have a limited number of guesses, though, so you'll have to be smart about it. I liked that the treasure words weren't gimmies - the first one I ran into was "rhubarb" - and that they're a nice change of pace between the monster fights. Levels can each be played through four times. The first is the "normal" play-through, the second is a timed version of the same level in which you're competing against both the monsters and the clock. The third version increases the challenge by adding additional requirements such as reaching the end of the level with at least a minimum amount of health remaining, and the fourth makes the monsters stronger and tougher and adds restrictions on the types of words that will damage them. You must complete all versions of a level to get a four-star rating on it, but only the first star is necessary to unlock the next level for play. Obtaining the fourth star is challenging, even on the first level. To claim these stars you'll need to come back to them later once you've improved your stats and gear. Stats and gear? This is where the RPG element of the game comes into play. When you complete a level at each star level you'll be awarded gems that can be spent in the game's shops. You can spend these gems to increase your base health, defense, and attack values, purchase spell books that give you a boost when you play certain types of words, and get your hands on new weapons that not only increase the damage that your words will do, but also provide unique buffs. Picking up a health potion or a potion to clear negative effects from the word tiles while you're in the shops is also a good idea. 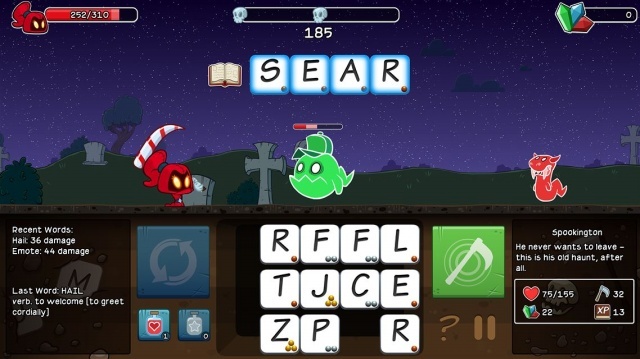 Unless you simply hate word games, you'll probably find yourself quickly falling under Letter Quest's spell. I really enjoyed the additional challenge imposed by the changing word requirements and restrictions as well as the positive and negative letter tile buffs. Although each level is bite-sized, I found that I was continually drawn to play another level until what was planned to be a quick game session turned into an hour or more with the game. I also liked the game's style and sense of humor - the monster descriptions and even some of the word definitions in the game are often clever and humorous. Challenge, humor, and a lot of fun, Letter Quest has it all. Final Rating: 92% - Word game fans should take up this quest because they will love the journey.